Clean Family Food: MRSA found in pork. Should my family stop eating it? MRSA found in pork. Should my family stop eating it? A Guardian investigation has found a strain of MRSA in pork sold at various supermarkets. Click here to read the articles. It's concerning especially as the problem is widespread in Denmark which supplies a lot of pork to Britain. There are bound to be lots of parents who will now worry about buying pork. The reality is that this is a problem stemming from excessive antibiotic use within intensive farming (geared to supply supermarkets) and not all pork. I headed to East Lancashire yesterday to interview Paul White from Roaming Roosters who supply free range pork to find out more about the difference between intensive and outdoor reared meat - video coming very soon. I saw where the pigs breed, live and are butchered. This kind of access would be unthinkable in intensive farming. There are farms like Roaming Roosters all over the country and and they often have online shops making higher welfare meat more accessible even if you don't live locally. 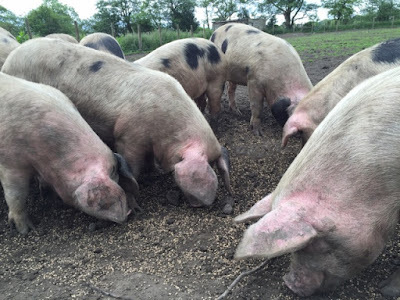 I am happy to continue buying my bacon and sausages from farms like these and hope that the MRSA scare encourages more shoppers to stop buying meat from supermarkets and source it instead from smaller, more responsible suppliers.